Living with anxiety and phobia of death, whoever you are, is never an easy thing to do. I remember people telling me, before I had my own kids, that I'd find things easier once I was a mother - I guess coz I'd be busier, my mind would be more occupied. It turns out, nothing could be further from the truth. Instead of worrying only about myself and my few close family members, I now have two little people (soon to be three) who I care about even more, who I worry about every single day. When you have anxieties like mine, and you overthink everything you see hear and read as much as I do, every aspect of life becomes a danger. Mealtimes, going out, staying home, going swimming, travelling - it all seems like a huge risk, and comes with it owns set of fears. But even if I was to never leave the house and wrap the kids up entirely in cotton wool, it wouldn't be any easier - I'd still worry that they were going to catch some horrible disease or be struck down with a life threatening illness. 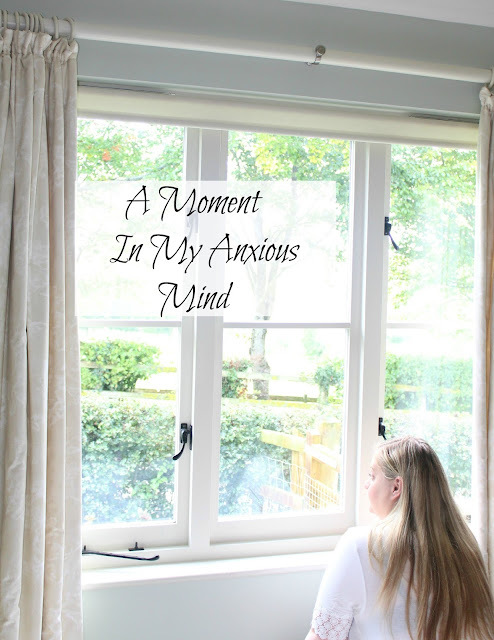 It sounds dramatic I know, but every moment of life as an anxious, over thinking, over worrying parent with these phobias is fraught with these panic-inducing fears and they can be impossible to overcome sometimes. But you try - you try to push them aside, you take whatever precautions you can without limiting their lives and experiences too much, and you try to distract your mind from the darkness of it all. It can be difficult to explain the feeling of anxiety to someone who's never suffered with it, and impossible to convey how truly all-consuming it can be. If, like me, you suffer with generalised anxiety and panic disorder then the most basic aspects of life can become a living hell for you - something as simple as answering the door can lead to endless panic-inducing thoughts and concerns, endless cycles of worry. What if it's somebody I don't want to talk to? What if I answer and it's somebody with some kind of bad intention? They could push past me and into the house. They could mistake me for somebody else and hurt me. They could be anybody. Maybe they're just cold calling but what if I get my words muddled up and I look like an idiot? I'm not dressed yet - will they judge me? What will they think about what I look like with no make up on? What if they make a comment that upsets me? All from a simple knock on the door. Sometimes I think it's quite common these days to pass off a minor lack of confidence as anxiety, and this in turn leaves people with the impression that anxiety is nothing much to be concerned about - that sufferers make more of it than they need to - that it's not a reason to shut yourself off from the world or "Allow" the condition to take over your life and stop you from doing anything. But it's not about confidence - it's not about ability - it's not about allowing anything. Sometimes I wish I could play out the thoughts in my mind on some kind of loudspeaker for everyone to hear - so that maybe they could get a glimpse into how it feels to live inside my constantly whirring mind, so that they might understand a little better why it really isn't just as simple as "switching off" or "being more confident" or "not caring what other people think". Anxiety can hit me at any point during the day - it's not restricted to when my mind is unoccupied, if it was it'd be a lot easier to control. It doesn't only manifest when I have a panic attack - thankfully those are much more rare these days for me, but just because you can't physically see the anxiety like you can when I suffer a panic attack that doesn't mean the same panic isn't silently present in my mind - it doesn't mean those same panic inducing thoughts aren't still there. I wonder if anxiety is a different feeling for everybody or if we all suffer in the same way - we'll all have different triggers I suppose - it amazes me how quickly my mind can turn a thought from quite a normal happy one into something so dark and terror-inducing that it surprises even me, even after a lifetime of suffering with these thought patterns. Here's an example - a little glimpse into how my mind works on a daily, even hourly, basis. Last night, before bed, I was brushing my teeth in the bathroom as I always do - this task takes perhaps 2 minutes to complete. I'll finish brushing my teeth and get into bed now, I need to fall asleep quite quickly so I don't feel too tired tomorrow. I want to do something fun with the kids tomorrow. I want to go somewhere nice. I feel so guilty when we don't go anywhere all day because one day the kids will be grown up and I'll miss their childhoods and I'll never be able to get them back. I wonder what it will be like when the kids are grown up - I wonder if I'll have a good relationship with them. I wonder if they'll come and visit me when I'm old. I'll be really old one day - I wonder if I'll end up in a nursing home? I wonder if I'll end up with dementia like my nan? NO! Don't let those thoughts come in now - think about something nicer - let's see....what can we do tomorrow? Maybe we'll go out for something to eat? We haven't been to Pizza Hut for a while, that'd be fun - oh but wait - that little boy choked to death at Pizza Hut a few weeks ago - I wonder if they're still serving grapes there? If only they hadn't been serving them then he wouldn't have died. Those poor parents - how must they be coping? How awful that they just wanted a fun evening out and it ended in such tragedy. They must wish they hadn't gone out that evening....Maybe we shouldn't go out anywhere tomorrow. Maybe it's just safer if we all stay at home. But bad things happen to kids every day at home too. I can't really protect the kids from everything. What if something happens to one of them? What would I do? I have a horrible feeling that something bad is going to happen to them....I don't know how I'd go on. NO...don't think bad things before bed, you'll never get to sleep - think about happy things! Let's see....you need to start shopping for the new baby soon. Its hard without knowing what colour to buy though - I wonder if this baby will be a boy or a girl. I don't really have any feeling about it either way - I wonder why that it is. Maybe it's a bad omen. Maybe something bad is going to happen to it. What if I die in childbirth and never get to meet it? If you'd seen me during this time - you'd never have a clue of the manicness of the thoughts running through my head - the randomness of the patterns, the irrational fears, the panic - you'd just see a woman calmly brushing her teeth before bed. And this is how I spend every day. And I imagine it's not much different for anybody with an anxiety disorder. They might look alright as they walk down the street, as they do their weekly shop, as they pay the bus driver their fare - but you don't know what's going on inside their head. You don't know how long it took them to build themselves to leaving the house that day. You don't know how on edge their nerves might be. Living with anxiety is a constant battle in your own mind, you're constantly trying to fight the negativity, you're always on alert for potential triggers, you're always fearful of the next big attack. So next time you hear about someone suffering with anxiety, please don't tell them to just "Not care what other people think" or "Don't let it win"... it's just not that simple for some people. Do you suffer with anxiety? As always, I'd love to hear from you! Oh my gosh! I'm exactly the same! I have anxiety and it gets worse at night and I struggle to shut down and it can be so upsetting and draining at times! Thanks for sharing! Another thing we have in common!